FCSD's Travis Toth of Maple Glen, PA, took first place in the Environmental Science Division at a Department of Energy Science and Energy Research Challenge (SERCh) poster competition. Toth, a meteorology major from Millersville University, worked with mentors Sally McFarlane and Laura Riihimaki, scientists in the Atmospheric Science & Global Change Division's Climate Physics Department to study high-altitude ice clouds in the tropics using NASA satellite data. 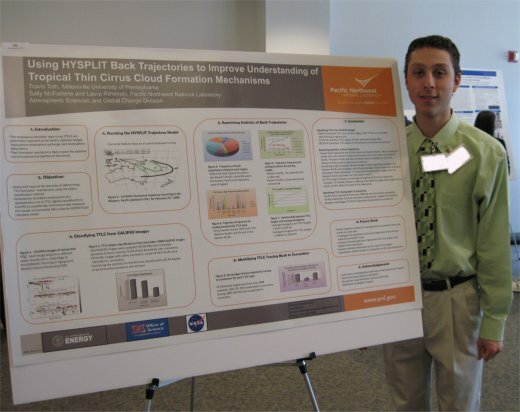 His poster topic was Using HYSPLIT Back Trajectories to Improve Understanding of Tropical Thin Cirrus Cloud Formation Mechanisms. Travis' summer research was funded both by the DOE Science Undergraduate Laboratory Internships program and by Dr. McFarlane's NASA New Investigator Project. "Travis' energy and enthusiasm for learning made it a pleasure to work with him this summer," stated Dr. McFarlane. Travis Toth of Maple Glen, PA.
Dr. Riihimaki agreed, "By the end of the summer, Travis told us that his experience doing summer research had confirmed his desire to pursue atmospheric research as a career. It was rewarding to be a part of mentoring a motivated student in his development as a researcher." An additional three FCSD interns of the 11 representing PNNL in the November 14-15 SERCh competition at Argonne National Laboratory included: Ivy Fortmeyer, mentor Julia Laskin; Melissa Christine Franch, mentor Karla Thrall; and Catherine Schweppe, mentor Aaron Wright. The DOE Office of Workforce Development for Teachers and Scientists sponsored the event with participation from 96 students from a variety of colleges and universities who competed in five divisions: Engineering and Computational Science; Energy; Environmental Science; Life Sciences; and Physical Sciences (including physics, chemistry and nanoscience). Those who attended the event were selected from among nearly 700 undergraduates awarded research internships at DOE's 17 national laboratories in 2010. While the poster competition was the focus of the trip to SERCh, the two-day event also included presentations by prominent scientists, seminars, and workshops, and opportunities for networking with students and faculty who expressed similar scientific interests. Congratulations to all the participants on a job well done!